The Great Barrier Reef (GBR) is a wonder of the world and this 30 minute helicopter flight lets you appreciate its beauty from above. Highlights include: Green Island, Outer Great Barrier Reef, Upolo Cay and Cairns. 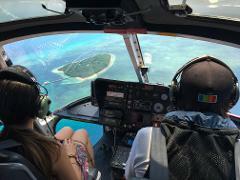 This 45 minute scenic flight of the Great Barrier Reef will create memories to last a lifetime. Highlights include: Fitzroy Island, Green Island, Outer Great Barrier Reef, Oyster Reef, Upolo Cay and Cairns. 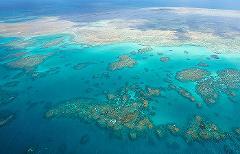 See two World Heritage Listed areas side by side - the Great Barrier Reef & the world's oldest continually living rainforest. Highlights include: Fitzroy Island, Outer Great Barrier Reef, Upolo Cay, Barron Gorge National Park and Cairns. A once in a lifetime experience. Marvel at the incredible spectacle of the Great Barrier Reef from the air, then snorkel amongst the beautiful corals below the azure waters. Sip champagne whilst soaking up the sun on pristine white sand. 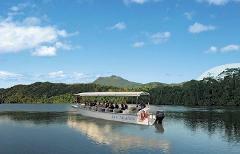 A fantastic way to see and taste what the Atherton Tablelands has to offer! 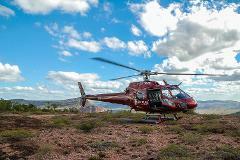 Let us fly you to 4 of the Tablelands’ finest establishments for the ultimate day out. Untouched, unspoilt and truly memorable. There is a lot of fact in the statement “The further North you go, the more unspoilt the scenery” and this is the case with this itinerary. 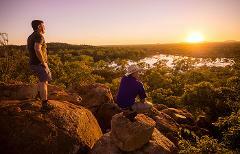 Fly the colour spectrum of North Queensland and experience the many landscapes the region has to offer. Highlights include: Johnston River Gorge, Undara Volcanic National Park, Wallamin Falls, Hinchinbrook Island, Great Barrier Reef. “Out Back of Cairns” takes you west of Cairns, soaring across the Great Dividing Range and over a changing landscape before landing at the Chillagoe Caves. Combine our 90 minute Reef and rainforest flight “On the Doorstep of Cairns” with a picturesque cruise along the mighty Daintree River. Fly along the mighty Daintree River out through the mouth to Cape Tribulation, the only place on earth where two World Heritage areas meet. Then it’s time to explore the oldest living rainforest in the world – pick your adventure! Join us for a unique Aboriginal cultural experience, exploring the Quinkan Rock Art sites found among the sandstone escarpments around the small town of Laura, guided by friendly Kuku Yalanji traditional owners. One of the great things about Cairns is that you don’t have to travel too far to see great things. Highlights of this tour include: World Heritage listed Rainforest, Barron Gorge National Park, Port Douglas, Great Barrier Reef. Enjoy stunning views all the way from Cairns to Cape Tribulation, where the Reef meets the Rainforest - the only place on earth where two World Heritage areas meet! 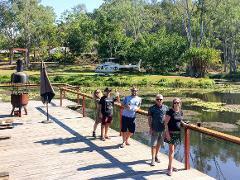 Visit iconic Atherton Tableland watering holes in absolute style on this 3 hour Heli Pub Tour. Marvel at the beauty of the area as you fly over Barron Gorge and Walsh's Pyramid before landing like a rockstar at two fantastic country pubs.